The Defense Department is no stranger to change and conflict, but this year proved to be a doozy even by Pentagon standards. From the January release of the Electromagnetic Spectrum Strategy to its strategies for mobility devices, cloud computing, cyber workforce, the post-Afghanistan offset and Asia-Pacific pivot, as well as a new strategic plan for the Defense Information Systems Agency and the recent innovation strategy, the Pentagon spent much of 2014 strategizing about the future. 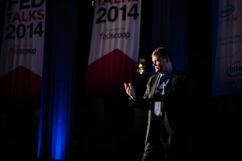 Defense Department Acting CIO Terry Halvorsen, speaking Nov. 6 at the 2014 FedTalks conference in Washington, D.C., said the biggest challenge for IT and information sharing is not technological but cultural. (Credit: FedScoop). In late April, DOD lost its two most senior IT officials within a few weeks of each other. Principal Deputy CIO Rob Carey was forced out in April, followed by CIO Teri Takai on May 2. Takai’s departure followed a shake-up in the Office of the Deputy Chief Management Officer and the transfer of responsibility for the department’s business IT systems from DCMO to Takai’s office. Questions about what the management shake-up might mean for DOD’s major IT strategies, particularly its cloud policy, were quickly answered when former Navy CIO Terry Halvorsen stepped into the acting CIO role for DOD. Halvorsen soon made it clear that he was not happy with DOD’s cloud policy and moved forcefully to revitalize the effort. Halvorsen released the revamped cloud policy in November. The bottom line on the new approach, Halvorsen told FedScoop, is to get to the cloud faster by distributing the contracting work, and saving money by forcing industry to offer cloud services for a price less than what it would cost the Pentagon’s own network provider, the Defense Information Systems Agency, to provide the same services. Beyond issuing a few strategy documents, DOD did manage to register other accomplishments, namely in the realm of diversity. In April, the Navy named Vice Adm. Jan E. Tighe commander of U.S. Fleet Cyber Command and U.S. 10th Fleet, making her the first woman in U.S. naval history to take command of a numbered fleet. Four months later, Vice Adm. Michelle Howard, the first African-American woman to command a ship in the U.S. Navy, made history a second time when she became the first woman promoted to admiral in the service’s 239-year history. By Dan Verton · Monday, Nov. 10, 2014 · 1:31 p.m.